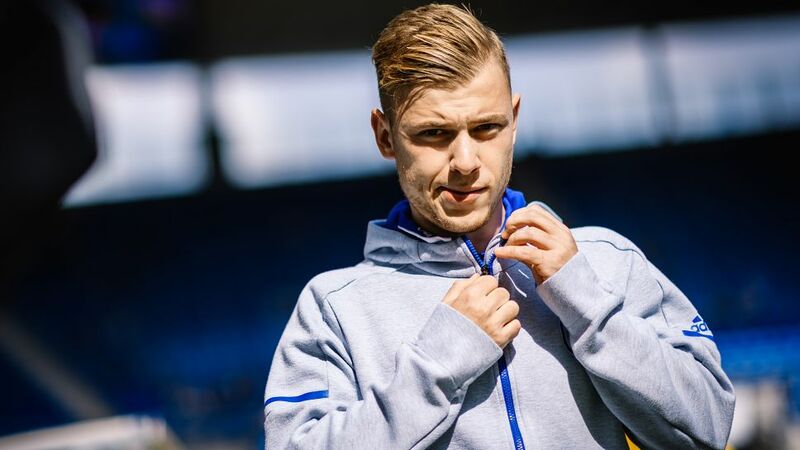 An Olympic gold medallist and one of the proudest products of the North Rhine-Westphalia city of Oberhausen, Max Meyer had already achieved more in the game before turning 22 than most manage in an entire career. Born on 18 September 1995, Max Meyer learnt his trade at FC Sardegna Oberhausen before scouts from the city's biggest club, Rot-Weiß Oberhausen spotted him at the age of seven. Meyer spent two seasons in RWO's youth academy before joining Duisburg, where he remained for five years. He signed for Schalke in 2009, making his Bundesliga debut for the Royal Blues in their 2-2 draw with Mainz on 16 February 2013 and setting up their equaliser with one of his first touches. His UEFA Champions League debut arrived just a few weeks later in their last 16 tie with Galatasaray on 12 March 2013 – still aged 17. After training or even after games for Duisburg, Meyer would often take a detour on his way home and train even more with a local futsal club. "Max was like a parrot who was released from the zoo for 90 minutes into the Amazon," said Naim Sassi, his futsal coach, to Spox.de. "Everybody could see how he was able to unfurl his creativity and he'd enjoy himself so much playing futsal that he'd end up warbling and whistling as he dribbled the ball. That's because he was being forbidden from dribbling so much when he played football." Although Meyer has made Gelsenkirchen his footballing home, he revealed how he would have preferred to have joined Borussia Mönchengladbach when he was 14. "I had a lot of friends there," he told Der Westen. "To be honest, Gladbach would have been my first choice. In hindsight, I'm happy with my choice." His performances for Schalke's youth teams earned him a call-up to Germany's Under-15s, and he later went on to help Schalke's Under-19s win the youth championship for the first time in over 50 years in 2012, beating Bayern Munich in the final. Max Meyer enjoyed his first major moment of fame – and earned Schalke plenty of fortune – when he came off the bench and set up Julian Draxler to put the Royal Blues 2-1 up in a UEFA Champions League play-off against PAOK in 2013. He was only on the field for eight minutes before being subbed off again as Schalke defended their lead, but that goal, according to the German media, had been scored thanks to Meyer's €20-million pass – calculating that Champions League qualification earned them at least that much money. Once the legendary Raul ended his playing days in Gelsenkirchen, his No. 7 shirt was up for grabs, and it went to Meyer. "To wear the number seven shirt now makes me proud," said Meyer. "I had to swallow for a second when I first found out, because I knew who had worn it before me. Raul was a genius footballer and that's why it's such an honour for me." Although Meyer has excelled as an attacking midfielder, he confirmed that Paris Saint-Germain's Italian holding midfielder Marco Verratti has inspired him in changing his role to a more defensive one in the 2017/18 season. "I am still in the learning phase in that position," he said. "You can learn a lot by watching Champions League games. I follow them closely. I always let myself be guided by the very best, and for me in central midfield that's Marco Verratti of Paris Saint-Germain." He has impressed in the new role, surprising even Schalke's sporting director Christian Heidel. "He is playing the best season of his life, and the coach has found a position for him that Max didn't believe he could play," Heidel said. "Personally, I didn't think he could either." Meyer has been likened to former Germany great Thomas 'Icke' Häßler, although he admits he does not know what to make of such comparisons. "I've heard it a few times, also from [former youth coach] Manni Dubski, but I really have no idea how Thomas Häßler played – I never recalled seeing him." Meyer does not suffer from memory problems: Häßler ended his playing career in 2003, when Meyer was only seven, but Dubski is a man Meyer trusts. "I've got a lot to thank him for. It was not an easy transition for me at Schalke after five years with Duisburg and Manni helped me a lot – it was he who brought me to Schalke." Meyer was still living with his parents when he turned professional, and beyond his 18th birthday. "I'm happy here because my parents take care of everything for me," he told Der Westen. "I never tidy my room and my mum moans about it all the time, but she's got to come to terms with it if she wants me to stay at home." Meyer did not have any posters on his wall when he was 18, but admits he did when he was younger, and one revealed his early sporting interests. "I really don't know if I'm allowed to say this, but a long, long time ago I was a Bayern Munich fan," he said. "But that really was a long, long time ago."